A complete frying batter, delicately seasoned with garlic and onion for unlimited, universal applications. 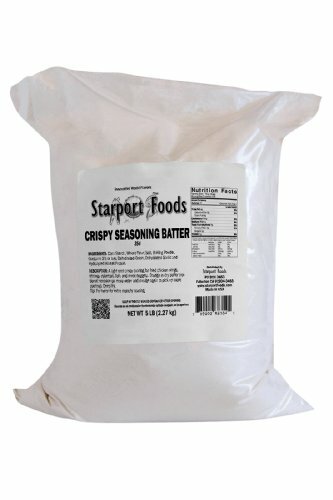 An excellent batter mix for Sweet and Sour pork, chicken, fish or shrimp. Incomparable! You must try it! It creates the perfect, light, crispy coating. Use this product dry. Double dredge for thicker coating. For a wet batter, just add water and mix well to desired consistence. To make and authentic Chinese batter, add chopped green onions and cilantro to wet batter. We recommend twice frying for extra crunchy crust that won't get soggy with Hawaiian Sweet and Sour sauce or Spicy Orange Sauce. Use for Empress Sesame Chicken, General Kahn's Sweet and Spicy Chicken. If you have any questions about this product by Starport Foods, contact us by completing and submitting the form below. If you are looking for a specif part number, please include it with your message. Ecostick Naturally White Single Serve Sugar Sticks, 2.8 Gram - 2000 per case. Pinnacle Foods Duncan Hines Family Style Chewy Fudge Brownie Mix, 84 Ounce - 5 per case.